Sonic 3D: Flickies' Island (Japanese: ソニック 3 (とりい)D (ぢい) フリッキーアイランド), also known as Sonic 3D Blast in North America, is both the final Sonic the Hedgehog title released for the Sega Mega Drive and the first on the Sega Saturn. Played on an isometric field, the mechanics of the game echo the previous core installments of the series, though the perspective and alternative objectives make it a unique experience in the Sonic catalog. While conceived and assisted by Sonic Team, the majority of development was done by UK-based game studio Traveller's Tales, who would go on to collaborate once more on the franchise with Sonic R.
The game would not be released in Japan until the end of the Saturn's life cycle, being the third-to-last first party title for the system, released on the same day as Sonic Adventure International. The Mega Drive version of the game would remain unseen in the land of the rising sun until its inclusion in the compilation title Sonic Mega Collection. Somewhere in the great oceans of the planet lies a mysterious atoll known only as Flicky Island. The home of the Flicky Bird race, the innocuous winged beings are surrounded by rumor and legend, with whispers that they have some connection to the Chaos Emeralds. It is these rumors that pique the interest of the nefarious Dr. Eggman, evil genius and arch enemy of a certain blue hedgehog. Reeling from his previous failures at obtaining the gems, the doctor decides to find the island, set up shop and try to discover what lies hidden within. During routine surveillance, Eggman spies a giant golden ring hovering over the landscape, where suddenly a flock of Flickies emerge from seemingly nowhere, perching on a nearby tree. After a moment, the entire lot fly back the way they came, through the center of the Dimensional Ring and vanishing once again. Realizing what he just saw, Eggman can barely contain himself. "So they live in another dimension, do they? Ha! I've discovered the secret of the Flickies!" Without hesitation, Dr. Eggman puts yet another plan into motion. Capturing the Flickies and placing them into robots, he hopes to harness their power and finally claim the Chaos Emeralds for himself. Unbeknownst to the mad doctor, Sonic the Hedgehog and his friends decide to visit Flicky Island at the same time. Entering the fringes of the Green Grove, Sonic looks for his feathered friends but instead finds a familiar sight: mechanical creatures roaming the countryside. With a single spin attack, our hero pops open the first Badnik, and sees a Flicky fly out. It doesn't take long for Sonic to guess that Eggman must be behind this. It's now up to Sonic to rescue the trapped Flickies, transport them safely back to their home dimension, and gather the Chaos Emeralds before Eggman can get his hands on them first. Sonic 3D: Flickies' Island is at its core a spiritual sequel to the 1984 Sega arcade title Flicky. Just like the Flicky/Chirp relationship, Sonic's main objective is to find all the Flickies in a designated area and bring them to the goal. Only then can the player continue on to either the next portion of the level or the next Act. As opposed to the traditional two-dimensional game play of the classic Sonic titles, the playing field is presented in an isometric, 45-degree angle, similar to the visual style of the Game Gear title Sonic Labyrinth. Even though everything is still sprite-based, the camera gives the allusion that Sonic is in a 3D world, able to see everything around him instead of just left and right. Each Zone in the game, with the exception of Final Fight, is split up into three Acts. The first two Acts, with the exception of Panic Puppet Zone, present Sonic with the same objective: to collect the Flickies so Sonic can reach the end of the level. Broken up into either two or three sections per Act, Sonic rushes about encountering Eggman's many Badniks. Destroying them is the only way Sonic can rescue the Flickies from being a living battery. Just freeing them isn't enough, the player having to touch the Flicky to make it follow Sonic's every move. No matter where in the game, there are always five Flickies that need to be brought to the goal ring. They can be deposited one at a time, all at once, or any degree in the middle, but only sending five back to their home dimension at once will insure the maximum amount of points available. There are four different Flickies that populate the game, each with their own travel behavior once free. 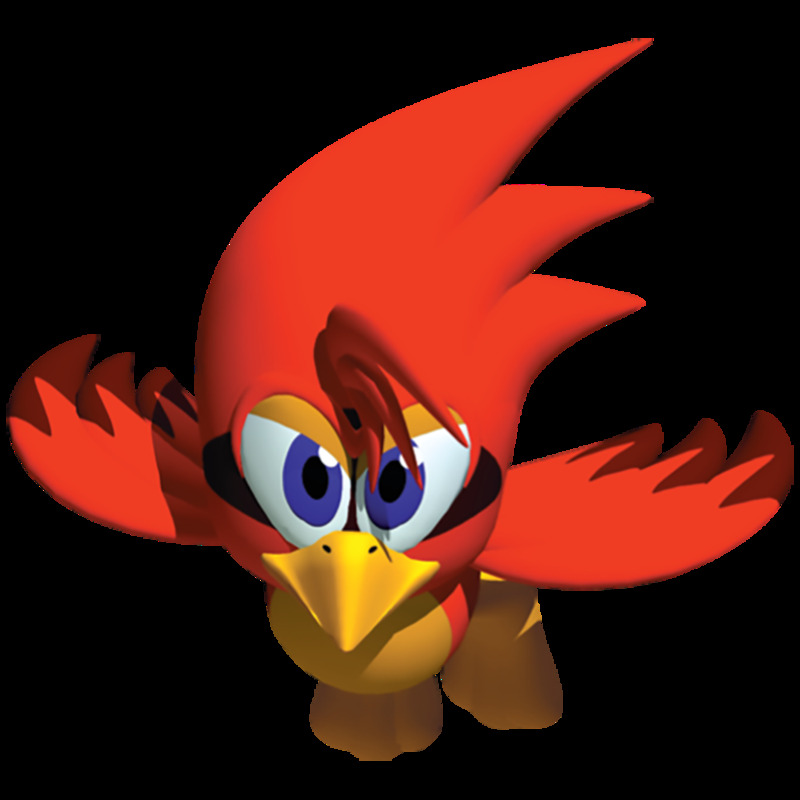 The most common and familiar of the group is the Blue Flicky, who make a conscious effort to find Sonic. If they cannot find him, they fly around in a tight circle, making them easy to locate. The second type is the Pink Flicky, which acts largely like blue ones, but fly around in bigger circles if unable to find Sonic. In the Mega Drive's Volcano Valley Zone, the pink Flickies appear bright orange, presumably due to color palette limitations. Red Flickies constantly move between two close points, not making any effort to find Sonic. Their movement range is small, but they jump very high and can thus be hard to catch. Rounding out the bunch are Green Flickies. Perhaps the most frustrating, they wander randomly with no interest in finding Sonic, even sometimes appearing to try and avoid him. The four Flickies in flight. Once a Flicky has made contact and follows Sonic, the player must still be aware of their surroundings. 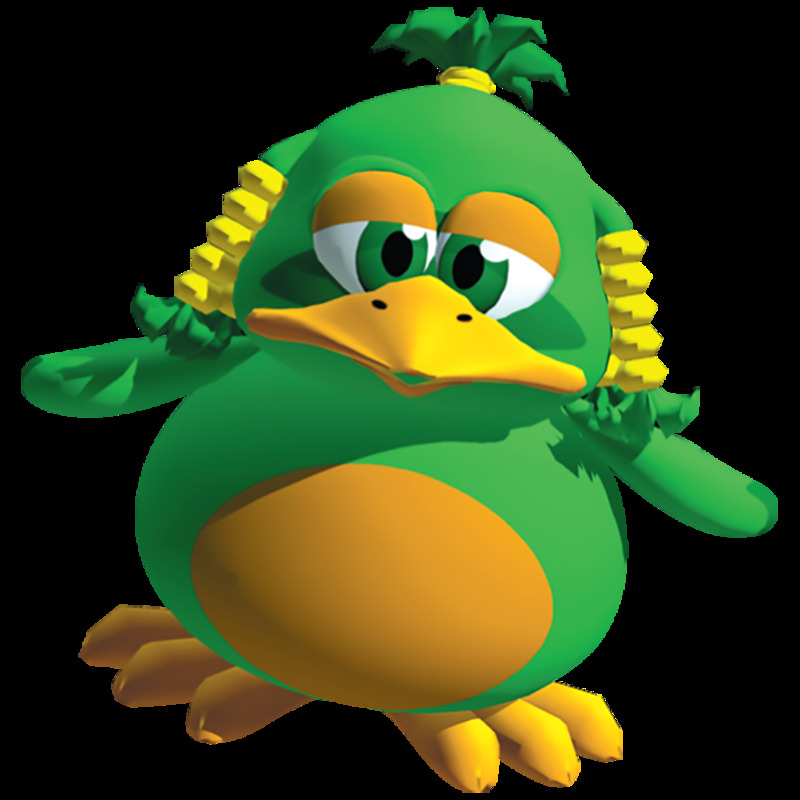 If Sonic takes damage while not wearing a shield, all the Flickies that are currently connected to him will disperse, a mad grab for rings made even crazier while trying to protect the endangered fowl. Even if Sonic doesn't take damage, stray projectiles and other hazards can separate hedgehog from bird, and if one isn't paying attention, it's possible to reach the end of a level, deposit the Flickies one has, and realize that the fifth has gone missing. Once Sonic jumps at the ring, swings through and all five birds are safe and sound, the ring disappears, allowing the player to either continue on in the game if a trap door lights up, or to finish the Act if there is an "X" on the ground. Due to the isometric nature of the game, Sonic controls slightly different than he normally does. While left and right on the D-pad still move Sonic in those directions, pressing up and down will move Sonic across the board just the same. The diagonal inputs on the Mega Drive controller finally come in handy, giving Sonic precise movement across each stage. The A and C buttons once again allow Sonic to jump into the air, curling into a ball and performing a spin attack that can destroy enemies, as long as Sonic doesn't land on spikes. Because Sonic can no longer crouch, the B button has instead become the de-facto method of having Sonic perform his other signature move, the Spin Dash. Standing still, holding the button down will rev up Sonic, allowing him to burst ahead in any direction, even able to destroy certain barricades. If Sonic is already in motion when B is pressed, he will curl into a ball and roll forward until his momentum is spent. Flickies are not the only object collectible within the game. Making its grand return are rings, a staple of the entire series. Having at least one on you will protect Sonic from damage, though if Sonic is attacked again while his ring count is zero and the brief window of invincibility wears off, he will forfeit a life. Collecting one hundred of the spinning circles will reward the player with an extra life. New to the game are Sonic Medals, which are also hidden throughout each zone. Many times placed above springs that can only be reached if you have a certain amount of Flickies, collecting ten of these spinning Sonic heads will reward the player with a continue. Sonic the Hedgehog in action. Item boxes also appear through the game, containing familiar power-ups to assist Sonic in his journey. Speed Shoes and invincibility are sprinkled about, allowing Sonic to gain an extra burst of speed or protect him from enemies and hazards, respectively. 1-Up boxes grant the player with their namesake, while the original shield from Sonic 1 and Sonic 2 returns, protecting Sonic and the Flickies from a hit that would otherwise cause Sonic to lose his rings and the birds that follow. The "Flame Barrier" shield from Sonic 3 also makes a comeback, appearing in levels that have a fire hazard. Brand new to the game is the Gold Shield, which gives Sonic the new ability called the "Sonic Blast Attack." A primitive version of the Homing Attack that would become a staple of the 3D games, pressing the jump button twice allows Sonic to home in on a nearby enemy, popping it open without fear. Along with springs, spikes, and bumpers, the checkered landscapes of Flickies' Island fit in with the aesthetics of Sonic's world, even if the controls are vastly different. Hidden in each Act are Miles "Tails" Prower and Knuckles the Echidna, standing about in idle animations. In their NPC role in this game, they are not easily discovered. Sometimes in a secret room, sometimes just off to the side in an uncertain path, they replace the Giant Ring as the entrance to the Special Stage. After collecting 50 rings and making contact, Sonic is instantly transported to the Chaos Emerald-collecting round. Echoing the goal of the Special Stage from Sonic 2, the player must collect the designated amount of rings in order to continue on. The Mega Drive and Saturn versions differ greatly, the former being an extremely simplified course of Sonic running on a metallic grate suspended over the background. The Saturn version, taking advantage of the hardware, is a fully-realized 3D obstacle course, visually similar to the Sonic 2 stages but amped up considerably. Eggman once again taunting the player. Each Act, starting with Green Grove and continuing through Volcano Valley, has one "Tails" and one "Knuckles" hidden. In the Mega Drive version, if you find both you can collect two Chaos Emeralds per Act. In the Saturn version, however, if you have already collected the emerald in that particular Act, the player will run through the same Special Stage and collect a 1-Up instead of another gem. In both versions of the game, you can still go to Special Stages after having collected all seven emeralds, the reward for both being extra lives. Though collecting all the Chaos Emeralds does not grant the player Super Sonic, they are needed to get the good ending of the game. Having all seven will transport Sonic to Final Fight, featuring the final confrontation between Sonic and Eggman in this installment of his never-ending adventures. Utilizing the Mega Drive's sound chip, a group of four musicians including Tatsuyuki Maeda and Jun Senoue put together the music for Flickies' Island. Taking a cue from Sonic 3 & Knuckles, each Zone's Act has a remix based around a shared theme. A handful of familiar tunes also reappear from Sonic & Knuckles, such as the Act Clear and 1-Up jingles. For the 32-bit version, the synthesized tracks were replaced by RedBook audio composed by Richard Jacques, meaning the game's music could be played on any standard CD player, minus the first track which contains only data. The Saturn's ending credits theme, "You're My Hero," is the first audio theme for the Sonic series since Sonic CD. Taking advantage of the media, the song was composed by Richard Jacques with Debbie Morris providing vocals. The sound test in Sonic 3D: Flickies' Island. While the composers and arrangers aren't listed normally, the information was discovered by Sonic Retro member ICEknight within the ROM. Additionally, while the final two songs are in the game's code along with the credits, they are not accessible through the sound test. Unused Song 2 was eventually repurposed as the boss theme for Sonic 4. While "You're My Hero" appears four times in the sound test, the song is only represented once in the RedBook audio. Some versions of Sonic 3D for Saturn (in particular the Japanese release) have two copies of Panic Puppet Zone Act 2. The Act 1 music is a copy of Act 2. Screenshot of the SEGA Saturn Special Stage. The Mega Drive version of Sonic 3D: Flickies' Island was originally conceived as the swan song for Sonic on the system. However, in the wake of Sonic X-treme's delay and subsequent cancellation, a Saturn version of the title was hastily commissioned to be ready in time for the holiday season. Completed in only seven weeks, the core gameplay and level layouts remained the same. The biggest differences were instead visual, the game taking advantage of the 2D powerhouse the Saturn was. Redrawn graphics with increased detail and color were complemented with flourishes of new animation in the scenery. Weather effects were also implemented, such as fog and rain in Rusty Ruins. Replacing the bare-bones Special Stage of the original was a brand new, fully three-dimensional half-pipe reminiscent of Sonic the Hedgehog 2, designed and programmed by Sonic Team. Rounding off the upgraded port was a brand new soundtrack by Richard Jacques, along with slick FMVs, a new menu, a map of Flickies' Island appearing during Zone transitions, and a pause screen showing elements missing from the in-game HUB. The original PC version of the game was a scaled down port of the Saturn entry, removing the weather effects and replacing the Special Stage once more with a toned-down recreation of the half-pipe. However, this was the only version to contain a save game feature. Between regions, the original Mega Drive ROM used is exactly the same. The title differs depending on the console's region code. In North America, the title is Sonic 3D Blast, while if PAL hardware is detected, the alternate Sonic 3D: Flickies' Island appears. There never was a Japanese release of the Mega Drive version, but if the game is played on Japanese hardware, it displays the North American title. The Japanese Sega Saturn version, on the other hand, officially uses the European title. 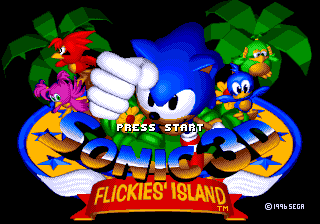 The PC version, if minimized or windowed, uses the combined name Sonic 3D Blast: Flickies' Island, though the proper region name will still appear in the title screen. All subsequent rereleases of the game have been the original Mega Drive version, including the downloadable edition through the PC service Steam. Sonic the Comic issue 104. Just like the many titles that came before, Sonic 3D: Flickies' Island received graphic adaptations in the pages of Archie Comics and Fleetway. Being the first timely adaptation of the source material, Sonic Blast tells the story of Dr. Robotnik stumbling across FLiCKiE Island, immediately robotocizing the birds and going after the Chaos Emeralds. With the Knothole Freedom Fighters intercepting the signal explaining his plan, Sonic, "Tails" and Rotor Walrus head to the island. Figuring out sea water will transform the birds back into docile creatures, Sonic and Eggman confront in the FLiCKiE Zone, visually similar to Rusty Ruin but Robotnik fighting in the machine used during Final Fight. In his defeat, Robotnik tries once more for a mad grab at the Chaos Emerald, but loses it anyway, becoming stranded on the island. Sonic the Comic adapted the game in issues 104 through 106, tying heavily into the ongoing narrative of the strip. In the wake of Dr. Robotnik being usurped as supreme ruler of Mobius, life seems to go back to normal for the Emerald Hill folk, much to the chagrin of the adventure seeking Sonic. His boredom is disrupted when "Tails" tells Sonic of a Flicky bird that suddenly appeared, who seems in distress. Travelling to Flicky Island, the pair discover the new hiding spot of Dr. Robotnik, planning to use the Flickies to power a new breed of Badniks and reclaim the planet as his own. Before things can escalate, a member of the Drakon Empire appears, asking who activated the Dimensional Ring. Taking Robotnik, Sonic and Tails are left to wonder what this means for the future of Mobius. Closing Theme "You're My Hero"
↑ sega:Press release: 1996-11-12: Sonic the Hedgehog returns to Sega Genesis with the need for speed in "Sonic 3D Blast"
This page was last edited on 12 April 2019, at 16:27.